OK - by that criteria isn't it better to have a large and a small map? Too me if the large map is 840 x 800 and the small map is 630 x 600. You would be better served to have 1440 x 1300 and then 630 x 600. Big monitor - desktop + phones and tablets all covered. Granted you would have to 'design' for playability of the small map - the large would pretty much take care of itself, I think. I've got a couple of things to fix - I'll get to them soon. You're doing a great job vaughn! I too think the size you have is good to help with the clarity, so I do hereby approve this size for the large map. One thing that should be worked on is the attack routes. Right now there is a lot going on with all the arrows and such. Have you tried just making the 2 way attack routes a continuous path, and then use the arrows for the 1 way attacks? That might help "unclutter" the playing area a bit. Also I think that for the same reason, you might want to merge a couple of the regions. For instance, Bali and Madoera and call it Bali. I noticed that you have a lot of 1 way attacks, most of which are the fleets to ports. You can remove those arrows and just add text to the legend that Fleets can 1 way attack closest port. This will clean up the map a lot! OK - That all sounds sensible. Thanks. As far as 1-way, 2-way attacks, etc. It all makes some sense in my mind and I'll post why I think it makes sense for this map. Of course gameplay is paramount and I don't want to be doing anything that will harm play. vaughn, can you please post the map and info on the latest page as well. This just makes it easier for player to comment on it. One thing before I delve too deeply into this...I think you need to make the Spice Islands inset more noticeable on the main part of the map. As is, I really had to search for where it was. Maybe just put a dotted box around it or something? Also, is the only way into the Spice Islands via the SP1 sea passage? Yeah - that's maybe a problem... Yes - SP1 to Spice Islands. Historically it looks like there was a very small area that contained the most valuable spice, so it is intentional - hopefully it doesn't screw up gameplay. I haven't thought a lot about the 'drop' - but maybe Spice Islands should all be neutral so it's kind of a race to hold the islands and make sure you have supply lines, i.e Armada and Major Port to exploit the Monopoly... Yeah..? nolefan5311 wrote: One thing before I delve too deeply into this...I think you need to make the Spice Islands inset more noticeable on the main part of the map. As is, I really had to search for where it was. Maybe just put a dotted box around it or something? Also, is the only way into the Spice Islands via the SP1 sea passage? Just put a box around spice island. vaughn03 wrote: Yeah - that's maybe a problem... Yes - SP1 to Spice Islands. Historically it looks like there was a very small area that contained the most valuable spice, so it is intentional - hopefully it doesn't screw up gameplay. I haven't thought a lot about the 'drop' - but maybe Spice Islands should all be neutral so it's kind of a race to hold the islands and make sure you have supply lines, i.e Armada and Major Port to exploit the Monopoly... Yeah..? Depends. A lot of players wont invest in hitting neutrals so making them neutral may make it so that players don't go for them. One of the graphics guys can probably give you suggestions on how to make the inset stand out more. I hope to have some more substantive gameplay input soon. 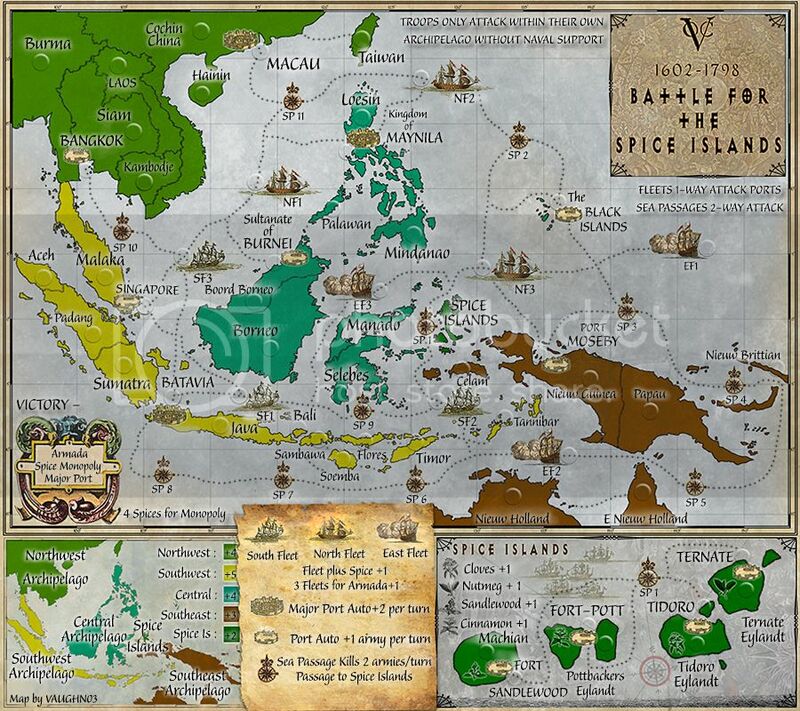 If making the Spice Islands stand out more for gameplay clarity then accuracy of the map is not so important. You may increase the size of the spice islands on the main map. Also try to match the shape of the islands so that they are recognisable. Can you mention what is an Armada just like you explain a monopoly? Yeah - the shape is different which is because the Spice Islands are a small part of that larger island chain - the Maluku Islands - which makes the map really confusing, I admit. Maybe some combination - please keep suggestions coming - it will take me a few days before I tackle this. Is an update on the horizon vaughn? Well, for now I think just work on making the Spice Island inset a little more noticeable on the main map. I will try to post something tonight about the bonuses, attack routes, etc. I've moved the islands apart to help make the map easier to read for gameplay. Revised Spice Island inset to - hopefully - make easier to understand while maintaining some semblance or historical/geographic accuracy. Damn, this is a gorgeous map vaughn. I will post some suggestions tonight. Thanks - I tried to do things to make the Spice Islands stand out on the upper map but it all just felt tacked on and made it more cluttered. Now the shapes match so I think it's easier to make the leap. Keeping lines to a minimum will help - looking forward to suggestions. 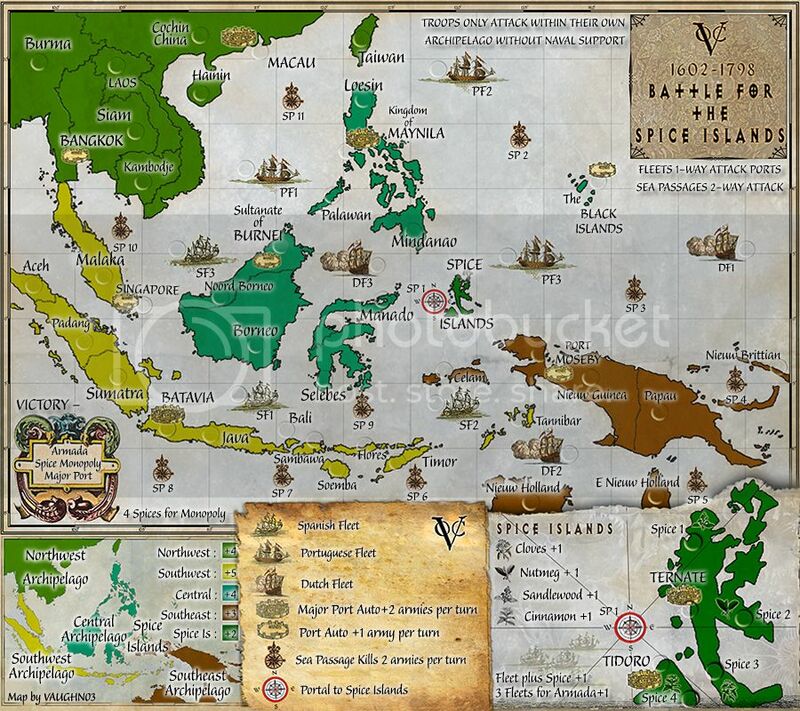 vaughn03 wrote: Thanks - I tried to do things to make the Spice Islands stand out on the upper map but it all just felt tacked on and made it more cluttered. Now the shapes match so I think it's easier to make the leap. Keeping lines to a minimum will help - looking forward to suggestions. It is less cluttered without the attack lines, but it's pretty unclear what attacks what now. I didn't particularly dislike the attack lines, so I wouldn't be opposed to you putting them back in. But if you really don't like them, what do you think about having the fleet of each country only able to attack a foreign powers colony, and instead of listing the bonus zones as Southwest, Central, etc., you can label them based on the European Colonies? Or you could just use the Ports to identify the different colonies? You could award the Spice Islands bonus as multipliers for holding a certain amount of fleet ships or colonies or whatever. I just posted it without them so I wouldn't F*** with it for hours... But I did stare at it for awhile and think maybe there is a way to say what attacks what without all the lines... Maybe I can just give 'rules'..? I was thinking along the lines of you can attack the nearest - fleet/port/sea passage - any examples of that? Could work? I still think it could be a little ambiguous. Have you seen Age of Realms 2, and how ports can only attack other ports connected by open water. Maybe something like that? Haven't played that one. I'll look. Extremely tiny nitpick, but saying "Four spices for monopoly" somewhat implies that there are more than four spices when as best I can tell there are only four. Perhaps "All spices" or "All four spices" to clear up the verbiage? You have space to make that two lines if needed.